Burger King announced an agreement with the Humane Society Wednesday to shift to cage-free hens. NEW YORK (CNNMoney) -- Breakfast at Burger King is about to get more humane. The nation's No. 2 fast food chain announced an agreement Wednesday with the Humane Society of the United States to switch to eggs from hens not kept in cages, and to only use pork products from pigs also not kept and bred in small cages. While rivals McDonald's, Wendy's and other food-service companies already have policies or agreements with the Humane Society on the humane treatment of pigs, Wednesday's announcement was the first by a major chain that it would switch to cage-free eggs. "What this does is send a clear message to these industries that their customers and the public don't want animals confined for their entire lives in cages. They will have to make changes," said Matt Prescott, food policy director for the Humane Society. 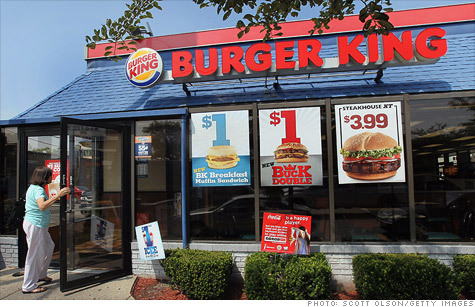 Burger King is privately held, but is planning an initial public offering later this summer. McDonald's (MCD, Fortune 500) did not have an immediate comment on move. Wendy's (WEN) spokesman Denny Lynch said his company doesn't sell breakfast at most locations, so it is concentrating on implementing more humane rules for slaughtering chickens for their meat than on the treatment of egg-producing hens. "You can't focus on everything," he said. The United Egg Producers, an industry trade group, says that cage-free eggs make up only 5% of the U.S. market, and have some environmental downsides, including a larger "carbon footprint" because the hens require more water, acreage and cropland than caged chickens. It said uncaged chickens can have more health problems and a shorter lifespan than those that are caged. It also said that cage-free eggs typically have a retail cost more than triple that of traditional eggs -- $1.18 for eggs from caged hens compared to an average of $3.59 for cage-free eggs. A 2009 UEP study found that banning cages for hen-laying eggs would raise production costs by 25%, or $2.7 billion annually. But Prescott said that a 2006 study done for UEP showed a much lower cost increase. He doubts that Burger King will have to pay significantly more for its cage-free eggs. "If retailers are jacking the price up for people who want cage-free eggs, that's not representative of the costs," he said. "I think what Burger King is doing is going to open the market up for cage-free producers and consumers who want that product." Prescott said he doubts the UEP claims that caged chickens are healthier or more environmentally sound. "It doesn't take a scientist to look at five to eight animals crammed into a cage the size of a file cabinet drawer and say this is wrong," said Prescott. It will take Burger King five years to make the switch to entirely cage-free eggs. He said the Humane Society focuses primarily on treatment of hens and pigs -- instead of cattle, which are even more widely used by the fast-food chains -- because they suffer from the most inhumane conditions. "The larger animals are, the harder it is to put them in a cage where they can't ever move," he said. "[Hens and pigs] are the animals that have it the worst in all of industrial agriculture." Organic eggs: Safe from salmonella?